We know. You’re not ready for the holiday rush. But if you’re in charge of putting together your corporate holiday parties, you’re probably already racing against the clock. That’s because most great holiday party venues want you to book your company party months in advance and the competition to find the right place is fierce. If you’re still looking for the perfect place to book your corporate holiday party, we have it. You’ll have a magical, memorable event if you book a Skyline Cruise. According to Digital Journal, Google sees an increase in the search term “holiday party ideas,” about midway through October. Once you’ve come up with a theme the race is on to lock up the venue. 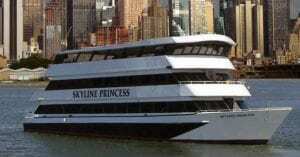 And Skyline Cruises has the perfect venue for your holiday party aboard our 3-deck luxury ship the Skyline Princess. Our corporate guests have been hosting holiday parties aboard the Skyline Princess since we started a business in 1993. Skyline is perfect for any occasion. We host all types of corporate gatherings, from holiday parties to meetings, retirement celebrations, team building events or you can choose to entertain clients. We host just about every other event you can think of as well, from proms, Bar/Bat Mitzvahs, sweet sixteens, quinceañara celebrations, and of course weddings. Many of the events we host involve a full ship charter. Many of our cruises leave from our home port at the World’s Fair Marina in Flushing, Queens. Our full ship charters also depart from many other ports in New York, New Jersey, Long Island, Westchester, and Connecticut. But we accommodate groups of all sizes as well. For example, we’ll often rent out a private deck on a public cruise for events. Some of our most popular weddings are on a private deck because they’re a fantastic value. We work with smaller events as well with some weddings made up of a small group of people. Skyline Cruises works with all types of groups and all kinds of budgets. It costs much less than you think. If you’re booking a holiday party or corporate event, Skyline recommends you do it on a weeknight. Try not to interfere with your employees’ and client’s family and personal time, which usually takes place on the weekend. We cruise year round and the Skyline Princess is climate controlled. Your guests will see some of the most iconic sites in the world from the Empire State Building to the Statue of Liberty. Our top deck, called the Skylight Deck has a dance floor and DJ space. The lower two decks are perfect for dining or to set a deck aside for a theme such as casino night. The food options aboard the Skyline Princess are top notch. We’ll give you choices of entrees, hors d’oeuvres, carving stations, pasta stations bistro tables and we’ll also give you desserts. Booking your holiday party or corporate event with Skyline Cruises is a surefire way to create memories. We have everything you need to help create something festive and fun. If there’s something you’re looking for, just ask our event planners. To get started, contact us today.